More than 5000 pieces of boundary cards made from sandpaper were handed to fans on their way into the ground with spectators more than happy to join in on the joke, and with security struggling to remove the offending items. Australia’s former coach Lehmann did not see the funny side, however, and tweeted his disapproval when cricket journalist Alison Mitchell posted a photo of one of the boundary cards that were being handed out. The Aussies had already been subjected to jibes after their warm-up match against Sussex in Hove, with the home fans singing ‘If you like sandpaper, clap your hands’ during the match. And matters on the field wouldn’t have made Lehmann feel any better. 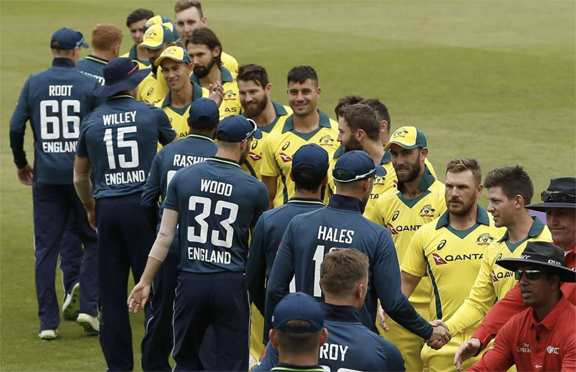 After winning the toss at The Oval, Australia opted to bat first but could only manage to post a total of 214 all out, with a few overs left to spare. Glenn Maxwell was the only batsman to mount any serious resistance by scoring 62 but England’s attack – particularly Adil Rashid, Moeen Ali and Liam Plunkett – did well to restrict the tourists to a relatively modest total.